Over 120 leaders from the Irish food and drink industry and the Minister for Agriculture, Food and the Marine Simon Coveney gathered at the Michael Smurfit School of Business, Dublin today for Bord Bia’s 4th annual ‘Pathways for Growth’ seminar. The ‘Pathways for Growth’ initiative began in 2010 when Bord Bia engaged Professor David Bell and Mary Shelman of Harvard Business School to work with the Irish food industry to develop a vision for the future of the sector. Today’s event highlighted how this process has since helped to inform and guide some of the most significant developments in the Irish food and drink industry, while Professor Bell and Ms.Shelman also outlined an updated vision to reflect the current issues and opportunities facing the sector. One of the key recommendations of the initial ‘Pathways for Growth’ report was to develop a single brand for the Irish food industry. In June 2012, Bord Bia launched Origin Green, a sustainability programme and brand, which articulates Ireland’s ambition to become a world leader in sustainability. Origin Green works across the entire supply chain – from farms to manufacturing – and as such it is the world’s first national sustainability programme. At farm level, Bord Bia auditors measure energy, emissions, water, biodiversity, and some socio-economic data, meanwhile for manufacturers the Origin Green charter requires three levels at which targets, stretch targets are to be set: namely, raw material sourcing, manufacturing processes, and social sustainability. “The success of the programme has hinged on an integrated industry approach whereby Bord Bia and its key stakeholders have all worked together to ensure that the structure is in place, not just for measurement and feedback, but for continuous improvement on a potentially mass scale; a national infrastructure that communicates to the international marketplace the sheer breadth and depth of Ireland’s commitment”, he added. Details of almost 18,000 dairy enterprises, accounting for virtually all dairy farms in the country, have been submitted to Bord Bia by 25 dairy cooperatives and they are in the course of undergoing their first audit cycle. 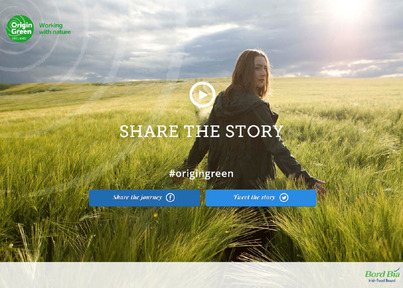 Last year, Bord Bia recruited 10 Ambassadors to help share the Origin Green story with global organisations. In June of this year the Ambassadors completed their first round of placements with leading global organisations including the World Wildlife Fund; Starbucks; Coca-Cola and Walmart. During his presentation, Mr. Cotter encouraged the Irish food industry to prioritise health and wellness as part of its social sustainability commitments. “Health and wellness is unarguably the single biggest long term driver of change in the food industry and those who can leverage it effectively are those who will ultimately prevail in the marketplace. People today are living longer and recognise increasingly the link between diet and health. Yet at the same time, healthcare budgets everywhere are under pressure. Obesity and its link to diabetes and heart disease attracts growing attention from the media, from government and from health professionals, bringing the food industry into ever more focus, with solutions sought in food labelling and sugar and fat taxes”, he said. Mr. Cotter argued that a sustainable food industry must be a socially responsible industry and that Origin Green should encourage the production of natural ingredients and healthy foods. He outlined that existing members of the Origin Green charter are already committing to improved health and wellbeing through initiatives such as the establishment of nutrition policies, the reduction of salt or fat and the removal of artificial flavourings and colourings.